Technology has changed the way we do so many things throughout the day. Recently, new wearable devices and applications are claiming to change the way we sleep at night as well. Whether they claim to help increase sleep or sleep quality, there are millions of tired people who would buy nearly anything that promises to fix the problem. Maybe you’re even considering giving a sleep tracker to someone you love for the holidays this year. But, the big question is, do they work? 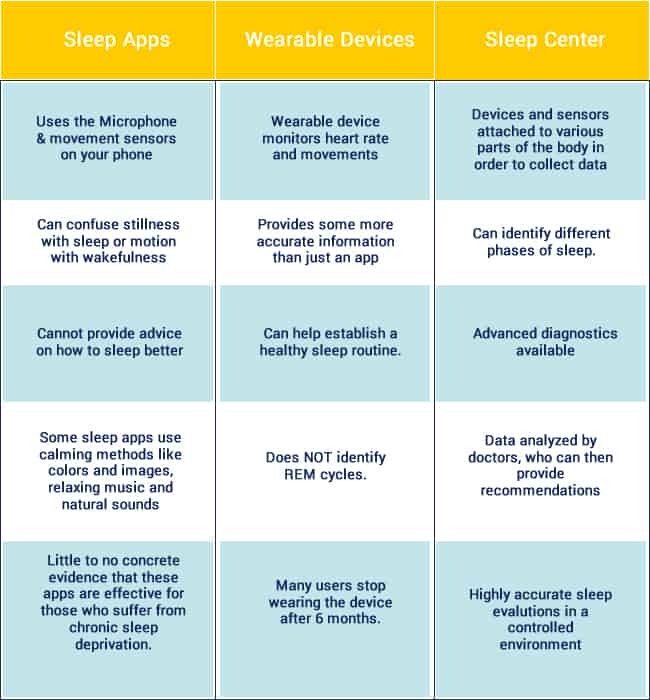 Let’s compare the accuracy of popular sleep apps, wearable sleep trackers, and professional sleep evaluations. Plus, we discuss what experts and users are saying about the effectiveness of this technology in changing nighttime habits and alleviating sleep problems. The App Store and Google Play have lots of options for apps that claim to track sleep cycles. Sleep Cycle and Sleep as Android rely on the phone’s microphone and movement sensors. Some users say they found signs of undiagnosed sleep apnea through the data recorded by the app. A smartphone has definite limitations when it comes to measuring sleep quality. Sounds, such as snoring, and movement or heart rate are just a few small factors in sleep. Most experts say that this isn’t enough information for the app to accurately identify the different sleep cycles. For example, the app can confuse lying still with sleep or a pet jumping up on the bed as a wakeful movement. Apps which track sleep can give you some helpful information about how and how long you rest, but they can’t provide advice on how to sleep better. Though there may be some placebo effect associated with sleep tracking apps, the real benefit is that they make people more aware of their circadian rhythms and bedtime habits. Luckily, listening to your body and aiming to get more rest are achievable goals which can also greatly improve your health. Some sleep apps use calming methods like colors and images, relaxing music and natural sounds to help people fall asleep faster. Other apps employ white noise, meditation, hypnotism or guided imagery and claim to help you get to sleep or stay asleep longer. To date, there is little to no concrete evidence that these apps are effective for those who suffer from chronic sleep deprivation. It’s important to note here the negative impact that electronic devices have on sleep patterns and quality. Though these apps can be nifty, using your smartphone can actually keep you up at night. Ensure that the 30 minutes to an hour before bed are screen free. Wearable devices, like Fitbit and Oura Ring, have been developed to help users understand their sleep patterns better. Because they are worn on the body, they provide a bit more information than apps alone. For example, Sleep++ is an app which integrates with the Apple Watch to collect heart rate data and track movement during the night. Other wearables track body temperature and the intensity of movement. Similarly, users have reported that wearable sleep trackers have helped establish a healthier sleep schedule and nighttime routine. They raise awareness about sleep habits and the importance of a full night of rest. Essentially, wearable devices help users prepare and plan for bedtime. Good sleep hygiene – like going to the bed and waking up around the same time every day – has been shown to successfully reduce insomnia. One main disadvantage of wearables is that the technology doesn’t (yet) enable them to identify REM sleep. Because wearables collect physiological data, but not brain activity, they can’t distinguish other phases from the restorative REM phase. Another disadvantage that researchers have noted is that many users stop wearing their tracker after about six months. With time, many users lose interest in the data provided and become less motivated to wear the device. A study by the Journal of the American Medical Association found little evidence that health trackers and wearables actually inspire long-term lifestyle changes. Now, let’s compare these gadgets and apps, to the sleep-tracking methods used at professional sleep centers. If you have used an app or wearable device and found signs of a sleep problem, the next step is to see a specialist. You also may get a referral to a sleep clinic from your doctor in order to help diagnose a sleep disorder. This data is then utilized by your doctor to assess the quality of sleep you get and diagnose any disorders. It can be the key to finding out why you don’t feel adequately rested when you wake and throughout the day. Sleep Health Solutions, in Cuyahoga Falls, Ohio, aims to make all visitors as comfortable as possible in order to perform accurate sleep evaluations. Contact Sleep Health Solutions at (330) 923-0228. to schedule a consultation.